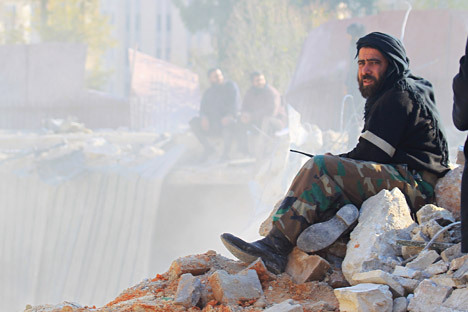 A member of a local security force, in charge of policing the area sits on rubble while he oversees the search for survivors at a site hit yesterday by what activists said were airstrikes carried out by the Russian air force in Idlib city, Syria, December 21, 2015. Russian analysts believe that China's participation in any military action in Syria is unlikely, because their interests in Syria are economic in nature. The daily newspaper the Washington Times reported recently that China could join Russia in its fight against ISIS in Syria. According to the newspaper, Beijing is concerned about the growing number of militants of Chinese-origin that have joined the Islamic State. “The real question is, whose side will they be on,” a defence official familiar with internal discussions on the Chinese role in the fight against ISIS told the newspaper. However, Russian military analysts believe China's participation is unlikely. They note that China has enormous interests in Syria, in which Beijing has invested tens of billions of dollars. Additionally, China is interested in maintaining good relations with Iran, Russia's partner in the coalition against ISIS. However, the Chinese also have close economic ties with a number of other regional players like Saudi Arabia and Qatar. All of this is likely to make China proceed with caution. China's participation in military operations against ISIS is unlikely, according to Andrei Ostrovsky, a China expert and the deputy director of the Institute of Far Eastern Studies at the Russian Academy of Sciences. “China has its own interests there, but China's main military doctrine is the so-called doctrine of defense sufficiency – not to interfere in foreign affairs,” Ostrovsky said in an interview with the news website Vzglyad. China's participation in the fight against ISIS may only be propagandistic, Ostrovsky added, and will be limited to cooperation with international organizations. The Uighur problem, which they talk about in the United States, is exaggerated too much, Ostrovsky said. Alexei Maslov, a specialist on China and the head of the Department of Oriental Studies at Moscow’s Higher School of Economics, also does not expect China to engage in military action. He recalled that China has never in its history taken part in military operations beyond its borders. Maslov predicts that China will also seek to obtain maximum economic benefit from the Syrian crisis.